A Decade of “Out of this World” Teaching & Learning with NASA! Posted on June 10, 2016 at 11:00 pm. This school year marks the 10th year of Barrett‘s partnership with NASA. Barrett was selected as the first elementary school in Virginia to become a NASA Explorer School, during the 2005-06 school year. The NASA Explorer School (NES) program was designed to support teachers in implementing STEM into the classroom to inspire future explorers, scientists, engineers and technicians. With funds provided by the NES program, Barrett teachers developed as STEM professionals through opportunities like conferences, such as NSTA & ISTE, working in the field with scientists in Yellowstone, and attending week-long summer trainings at NASA centers around the country. Teachers returned from the professional development sessions excited to share their learning with students and other teachers. After Robotics training at NASA’s Jet Propulsion Laboratory, two Barrett teachers started a robotics program for students that was funded by Barrett’s partnership with Lockheed Martin. After completing the Orion Exploration Design Challenge, students’ names were flown aboard the test flight of the new Orion spacecraft. Currently, the names of Barrett students are roaming on Mars with the Curiosity Rover. For Hubble Space Telescope’s 16th birthday, retired speech teacher Linda Carter dressed up as Hubble to help the students learn about the instruments, followed by a cake frosted with Hubble’s image. Over the years, Barrett students have won several NASA national competitions, including the Lunar Plant Chamber Design; the Liquid Waste Recycling Design Challenge; Moon Math Competition; Optimus Prime Spinoff Challenge; and the Spaced Out Sports Challenge, focused on Newton’s Laws of Motion. As a result of earning top honors in these challenges, students presented their research at Kennedy Space Center’s Goddard Space Flight Center, and had their projects implemented by astronauts on the Space Station. In addition, students designed experiments that their teachers carried out in reduced gravity on NASA’s “Vomit Comet” near NASA Johnson Space Center in Houston. Astronaut Dr. Roger Crouch and a team from NASA Stennis Center set up experiments and activities for the students to visit throughout the day–imagine building a rocket with an astronaut! Students have video-conferenced with NASA scientists, engineers, education specialists and even the director of the Kennedy Space Center. This year Barrett fifth graders were the studio participants for a Google Hangout with NASA and the UK Royal Institute about the future of human space exploration. Astronaut Leland Melvin inspired students and their families at one of Barrett’s STEM Nights. 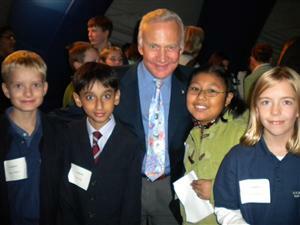 Students have met famous astronauts, such as Apollo 11’s Buzz Aldrin, and Sally Ride, the first female American in space. Students have even participated in Astronomy Night at the White House and sat right next to President Obama and his family in the inflatable planetarium. As we approach the 2016-17 school year, Barrett is looking forward to another fabulous decade of teaching and learning with NASA! To see the NASA Explorer School program in action, follow Project Discovery on Twitter @LSullivan. Photos areposted on Flickr. Also in "June 10, 2016"